Boston's mixtape showoff Statik Selektah is taking his act down to the festivities of Memorial Day Weekend with special host and legendary radio personality Lord Sear (of The All Out Show w/ Rude Jude). Together, these two SHADE 45 satellite radio personalities launched their official Soundtrack To The Summer mixtape and Statik will be migrating South for the holiday to give away as many copies as he can bring with him. The mixtape veteran and accomplished producer/DJ (he's done production or cuts for tracks with AZ, KRS-One, Nas, Royce Da 5'9" and Method Man) is headed to South Beach, Miami to dole out mixtapes. 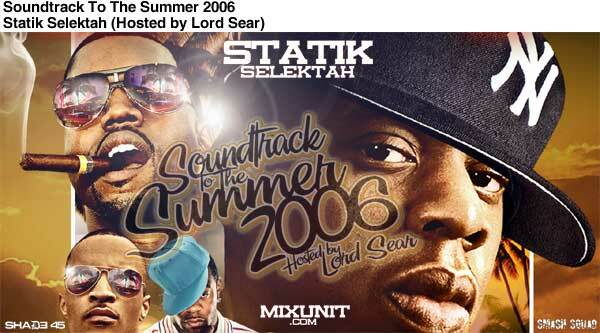 Featuring a gang of exclusive cuts, original remixes, new blends and tracks produced by Statik solely for this mixtape, Soundtrack To The Summer 2006 has a little something for everybody. To suit the needs of Miami's diverse party crowd, Statik brings you joints from the North, South, East and West. Paying his respects to the 305, Statik starts with the "Hustlin' (remix)" featuring Jeezy & Jay-Z, and the rest of the tape is pure drama. Including remixes like "Crazy" w/ Gnarls Barkley & Kardinal Offishall; "Wanna Love You" w/ Robin Thicke, Michael Jackson, Busta Rhymes & Pharrell; and "It's Goin' Down" w/ Yung Joc, Paul Wall and Lil' Wayne. This mixtape also features tracks from Kanye West, Nas, T.I., Lloyd Banks & Run DMC, Papoose, Rick Ross, Consequence, Big Boi & Sleepy Brown, Ghostface Killah, Mary J. Blige, Timbaland & Nelly Furtado w/ Biggie, Mobb Deep & Ray Cash. Submitted by afineblade on Mon, 05/29/2006 - 8:28am. Submitted by 3rik on Mon, 05/29/2006 - 8:31am. Submitted by rodman43211 on Sun, 06/04/2006 - 5:25am. how did you get this cd to download. any help would be greatly appreciated. Submitted by Little-D on Tue, 05/30/2006 - 1:45am. Submitted by Setsu on Thu, 06/01/2006 - 1:44pm. Submitted by paidthacosttobe... on Wed, 06/14/2006 - 2:44am. Submitted by sqrk (not verified) on Wed, 08/06/2008 - 1:00pm.